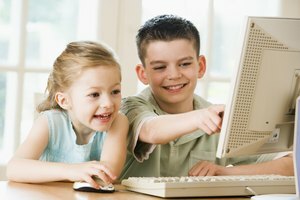 Computers can enhance the early elementary learning environment. Using technology in the classroom expands usable learning materials and students' experience. 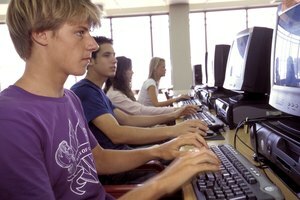 According to the U.S. Department of Education, computers increase student engagement and motivation and accelerate learning. A computer should be used to complement the current classroom topic and be integrated in ways that develop intellectual skills. Balance and timing are key. Simply putting a student in front of a computer cannot replace a live teacher. The teacher must remain the facilitator. Unlike passive forms of technology, such as television or videos, a computer requires interaction. Using a computer in an early elementary school classroom offers students the opportunity to control the pace of an activity and to repeat an activity again and again. Computers provide students an interactive experience that develops curiosity and independent thinking and problem solving skills, according to Dr. Bruce D. Perry, an internationally recognized authority on brain development and children. When it comes to using a computer in an early elementary school classrooms, teachers should focus on the basics. Students need to learn how to use a keyboard, mouse and headphones. Approach these topics with a teacher-led class presentation and after children have mastered the basics, they can practice on the real thing. Help students develop an appreciation and excitement for computer usage while also introducing basic computer skills through games. Common Core State Standards outline what skills students are expected to understand and be able to do from Kindergarten through high school in math and English language arts. Most school systems also have an additional core curriculum in place for social studies and science. Computers can enhance early elementary core curriculum work, helping students learn and practice arithmetic, study weather, plants and animals, read maps and learn about their community, and practice reading and writing skills. Computer intervention can benefit students whose language skills are not at grade level. 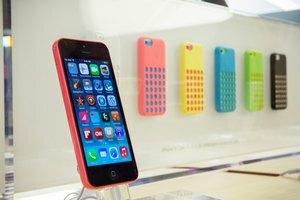 Research conducted by Torgesen, Wagner and Rashotte at Florida State University shows that computer technology can serve as a long-term solution for dyslexic students because it allows for highly specialized instruction and consistent practice. Gorman, Fitzalan. "Should Computers Be Used in Early Elementary Schools?" Synonym, https://classroom.synonym.com/should-computers-used-early-elementary-schools-3986.html. 26 September 2017.